While running TheBody.com, a world leader in the distribution of HIV/AIDS information, founder James Marks developed Expert Viewpoint (EVP), a unique Q&A software solution for presenting and managing health experts. Marks wanted to use the software to help gay and lesbian organizations around the country leverage their expertise in areas of shared interest. He hired Cabengo to implement EVP on client sites. We gathered requirements, customized EVP templates to match existing client designs, and set up the database to support each client’s panels of experts as well as to syndicate selected experts from other organizations. To date, we have implemented EVP on the following client sites: Family Equality Council, Human Rights Campaign, Fenway Health, Center on Halsted, The Lesbian, Gay, Bisexual & Transgender Community Center, L.A. 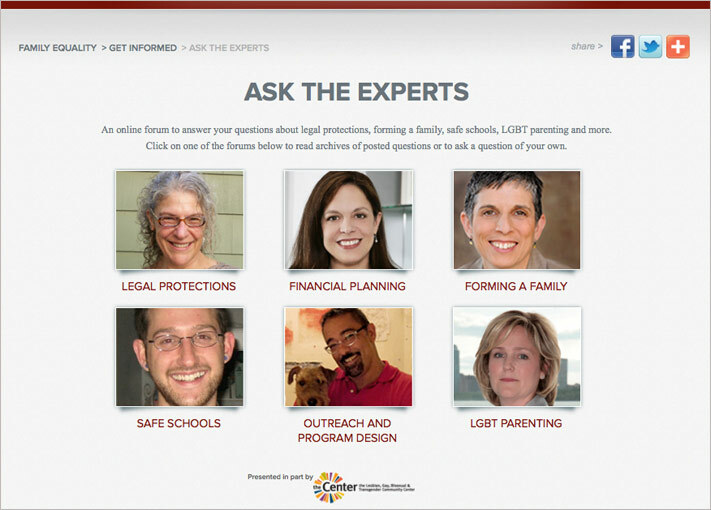 Gay & Lesbian Center, and Services and Advocacy for GLBT Elders (SAGE).